Buckeye Valley’s Tess Hughes, right, works against Granville’s Isabella Yeager during the first half of Tuesday’s Division II district semifinal at Highland High School. The Buckeye Valley girls basketball team will get the chance to bookend history in a unique sort of way. 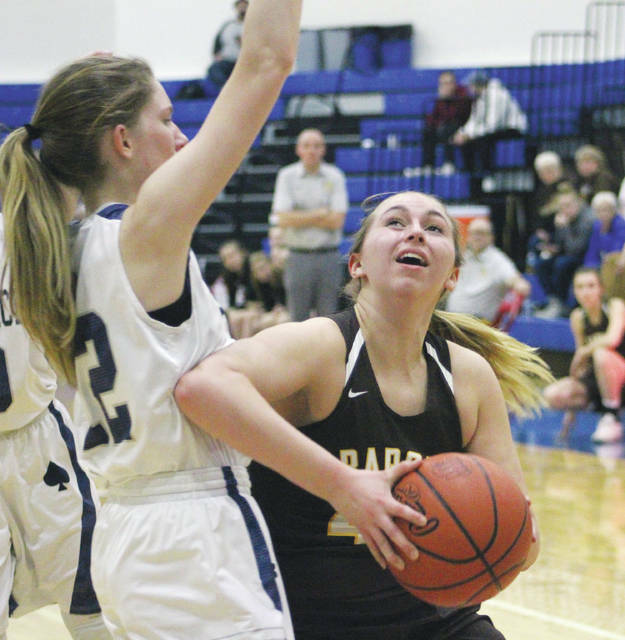 The sixth-seeded Barons’ defense stood tall for the third time in three tournament games, holding fourth-seeded Granville to just two field goals in the second half of a convincing 41-23 district semifinal win Tuesday night at Highland High School in Marengo. The win gives BV the opportunity to win its first district championship since 1993. BV coach Travis Stout didn’t think his players understood the historical significance … and he was fine with that. This version, however, has done it with some stout defense. The Barons have allowed just 50 points over their three tournament games. Tess Hughes’ put-back gave BV a 7-5 lead with 4:55 left in the opening quarter in a game it never trailed. The basket started a 12-2 run that pretty much put the game out of reach. And it was a good thing the Baron defense stood tall because their offense had a difficult time in the middle two quarters, making just one field goal from the start of the second quarter to the 4:20 mark of the third. Lisa Leienberger stepped in front of a pass and threw long to Scowden for a layup to finally break the drought, giving BV a 26-15 lead. Cowan led with 12 points and Scowden and Dani Grether each added 10 for the Barons (19-6), who extended their winning streak to 10. Meanwhile, the Blue Aces couldn’t get close enough to threaten. Lainie Hilaman rebounded a missed shot on one end and went coast to coast for a buzzer-beating layup to cut the Granville deficit to 23-15 at the break. The Barons used a 6-1 run in the third to break the game open and Granville never got it back to single digits. Hilaman scored a game-high 14 points for the Aces (17-7). BV and seventh-seeded Bloom-Carroll hook up Friday night at 8:30 p.m. at Westerville Central High School for the D-II district crown.